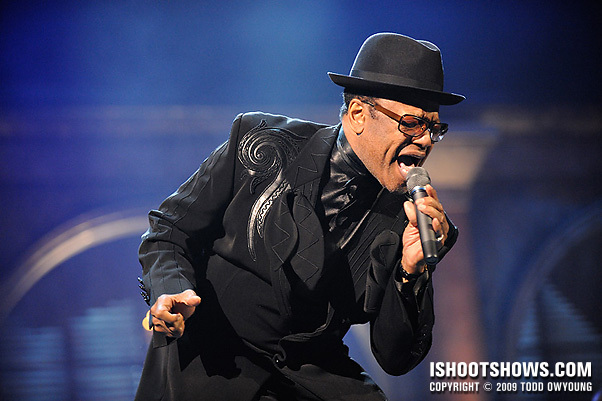 One shot of Bobby Womack performing after his induction into the Rock & Roll Hall of Fame, April 4, 2009. The induction ceremony was an interesting assignment because the inductee performances only lasted for a song or two – so even shorter than the standard “first-three” rule. Combined with the star factor of the people on stage, the commission itself, and the short time, the Hall of Fame gig was a fun challenge all around. I'm getting to the full sets from these, I promise. Bobby Womack is the man! I recorded all music for “New York Undercover” in the 90’s. We re-recorded Bobby singing his song “If You Think Your Lonely Now”. It was at East Hill Studios in NYC (now defunct). The band had already recorded all the instrumental parts and I got a rough mix ready for Bobby to sing to. About an hour before Bobby was to arrive, I set up the mic, got rough levels set, etc. Time for Bobby to arrive… no Bobby. We waited, and waited. About an hour late, we get a call from the front desk. “I just buzzed Bobby Womack up”. Ok. It’s on. Bobby walks into the control room, takes his leather jacket off and lays it on the producers table. He leaves his sunglasses on. He doesn’t say a word. Not even a hello. He just walks back out through the sound lock and into the live room. He positions himself behind the mic and I roll tape. I ALWAYS hit record even when getting levels just in case magic happens. Fortunately in this case, my rough guess for levels was pretty close to spot on. Which was a good thing…. because MAGIC HAPPENED! Bobby proceeds to through down the most amazing vocal I’ve ever heard. It was incredible. He finishes the song, comes back into the control room, grabs his jacket and leaves. Still never saying a word to any of us. He KNEW he nailed it. I didn’t even stop the tape. We were all speechless. It wasn’t until the tape ran off the real and made a loud racket that we started talking. We had chills it was so good. Fantastic story. Thanks so much for sharing it. A lot of vocalists claim to do a track in one take, but it must be amazing to actually witness that happen – especially when it’s a legend like Bobby Womack. Thanks again, awesome story.